Virtual reality – it’s the wave of the future. The idea of being able to immerse yourself completely in a gaming or viewing experience is certainly not a new one, but it’s only now that the technology is reaching the capabilities to provide such immersive experiences. Unfortunately, virtual reality is not cheap. 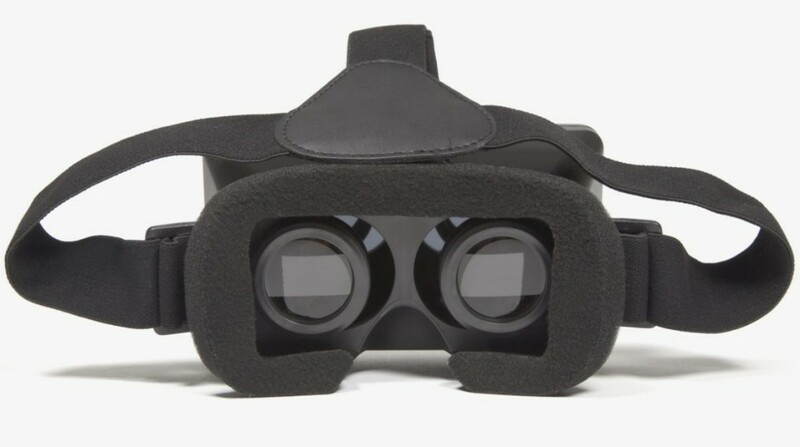 For those of us who don’t have piles of extra cash just waiting around to be burned, the idea of a personal virtual reality headset is likely still just a dream. The Immerse Virtual Reality Headset from Thumbs Up! is created for just that sort of technophile. If you love trying out new technology but have those irritating things called bills piling up, then it just might be the virtual reality experience you’re looking for. The Immerse headset combines your existing technology – a smartphone or mini tablet – with a headset device. If you’ve ever seen Google Cardboard, then you likely are somewhat familiar with the idea. You strap your phone into the device, and then peer through for your virtual experience. If you’ve actually ever used Google Cardboard though, you’ve probably foudn some issues with it. For one thing, it’s made out of cardboard. That does make it very inexpensive, but it isn’t high on comfort or durability. You also need to hold it up to your eyes at all times, and it does let a decent amount of light through, make for a far less immersive experience. I see the Immerse headset as a bridge between something like Google Cardboard. 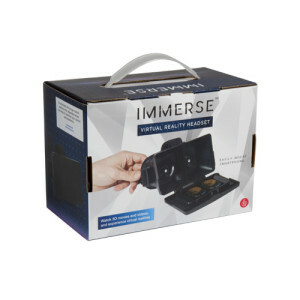 The Immerse headset, currently selling at around forty dollars in the U.S., is still relatively inexpensive when compared to a standard virtual reality headset, and it combines a lot of the good aspects of Google Cardboard with the comfort and durability it doesn’t offer. Though you do still need to strap in your own phone or tablet, it is a true headset that attaches securely to your head, offering you full range of motion without having to hold it up. The headset has elastic straps that go around both the back and top of the head, and they are fully adjustable to allow you just the right fit. The portion that fits over your eyes is lined with thick foam all around, making it quite comfortable to wear for even long sessions. The eye pieces themselves can be adjusted as well. Two tabs on the top of the headset allow you to move them out or in to adjust to your particular face. The lens themselves can also be adjusted for focus by turning the lens until they reach your viewing comfort, much like a pair of binoculars. The eye pieces are set into the hard plastic case, which has a smooth rounded area for your nose to sit comfortably. The front of the headset opens up with the push of a button. You simply insert your phone into the pressure mounted tabs, and click it shut. It’s fairly roomy, so even larger smartphones fit nicely. There are earphone tabs on both sides of the headset, so you can use your earphones with the headset if you like. The whole thing is made of fairly sturdy plastic, so it should stand up nicely to the test of time (or loads of kids wanting to try it out, as may be the case). We tested it on a variety of ages and head sizes, and everyone was able to find a comfortable fit. It’s quite comical to watch someone try it on for the first time, as their arms outstretch and they fumble around to get the hang of it. The nice part about the elastic straps and foam around the eyes (aside from comfort, of course) is that it blocks out external light, which really enhances the experience. It also makes it easy for you to use your whole body to control the game, as your movement isn’t restricted at all. When you turn on an app, you really do feel like you are walking in the jungle, riding the roller coaster, or swimming with sharks, because your eyes aren’t distracted by outside things. Though I was impressed with the viewing experience provided by the Immerse Virtual Reality Headset, there are a few caveats. Because it is designed to rest snuggly against your face, you really can’t wear glasses while using it. For most, that won’t be an issue, as what you are looking at is literally right in front of your face. However, if your vision is really bad (like mine), it might still be just a little blurry, so plan on wearing contacts if this might be an issue for you. You also cannot access your phone without opening the headset. Again, this isn’t really an issue most of the time, as most of the virtual reality apps are meant to be controlled by your movement, but you do have to flip it open each time you want to change to a new app. 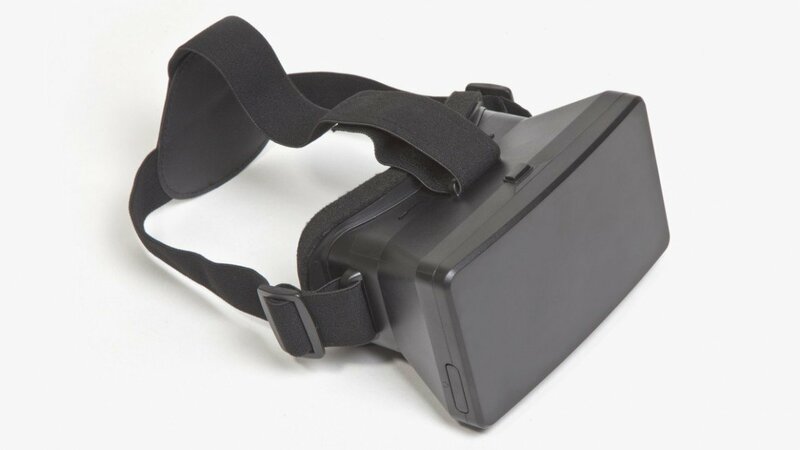 Overall, the Immerse Virtual Reality Headset from Thumbs Up! offers a truly immersive virtual experience without breaking the bank. 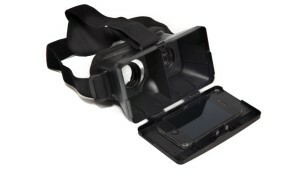 It’s comfortable and sturdy, and fits a variety of both phone and head sizes. If you’re looking to give the virtual reality technology a try without investing too much into it, it’s a great bridge between the existing cardboard and expensive tech. You can ride virtual roller coasters, walk with dinosaurs in the jungle, or enjoy your favorite 3D movie at home – and still be able to afford some popcorn. Some of the best mobile games of 2015 so far.